What Makes a Church Integrated & Multicultural? For the record, I am white. In fact, for my 40th birthday, I did one of those cheek-swab kits to find out my mitochondrial DNA and learned that I am Really White. Of the two churches I’ve served as pastor, one was 100% white and of European descent. The other included members who were white, black and brown with members born in Europe, Asia, Africa, North and South America and Australia. But that church was still predominantly white and of European descent. So was my second church integrated and multicultural? I would say no. If I’m white and a member of a mostly white church, except for a handful of African-American or Asian or Latino members, I probably see my church as multicultural. If I am one of those African-American or Asian or Latino members, I probably see my church as white. What makes a congregation integrated and multicultural? Is it possible not to have one race or ethnicity dominate? Several years ago, a new church plant was established in my then Presbytery that was intentionally planned as an African-American church. This is not to say that non-African Americans were unwelcome, but the preaching, music, leadership, and outreach was going to focus on the immediate neighborhood which happened to be African-American. The church has thrived. There was some controversy about so overtly planting a church for a particular racial demographic, and maybe that was a choice that the next generation of church planters will not make. But when I see multicultural churches encouraged, there is almost always a dominant race in terms of leadership, styles, etc. Is a church considered integrated and multicultural if the pastor is one race and the rest of the congregation is another race? Is it essential that the leadership – particularly the pastors – reflect the racial/ethnic demographic of the congregation? Power issues come into play, of course, and integrating a congregation seems best when it happens organically. But the bottom line is that God’s Realm includes everybody of every color and ethnicity (and age, gift, education level, economic situation and place on the gender/sexuality spectrum.) And don’t we ultimately aspire to be a church that looks like the Realm of God in every way? 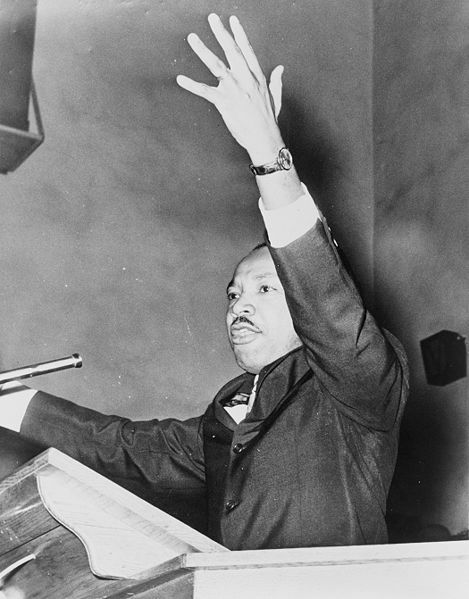 Image of Martin Luther King, Jr. who moved to Chicago in January 1966 and preached among several Chicago congregations, including First Presbyterian Church on Kimbark.